Adolf Hitler came into power in 1933 already surrounded by a personal bodyguard drawn from Nazi Party loyalists, but internal politics made it wise to include the regular army in the mix as well. The Berlin Watch Regiment had been providing ceremonial guards in the city since 1921, marching to the War Memorial every Sunday with its full band and seven companies of infantry, one from each of the Reichswehr's seven divisions. With the expansion of the Reichswehr into the Wehrmacht, the regiment changed as well, at first drawing individual soldiers from regular units and finally recruiting its own new men. In January 1939 Hitler directed it receive a new name, "Greater Germany" or Grossdeutschland. The regiment continued to provide ceremonial guards, and also a detachment to guard Hitler himself. Some Grossdeutschland troopers on the march. Grossdeutschland did not participate in the attack on Poland, as it was still at the Grafenwöhr training ground undergoing conversion from a ceremonial unit to an elite motorized regiment. To help in this transition, the regiment gained a new III Battalion when a unit of elite demonstration troops was added to the two "guard" battalions of the old unit. A IV Battalion with support weapons was added at the end of the year. While Grossdeutschland missed the Polish campaign, it was assigned a front-line role for the attack on France in May 1940 as part of XIV Corps. Though officially described as a detached motorized infantry regiment, it was a powerful brigade-sized formation with lavish supporting arms. Three motorized infantry battalions were organized on the standard German Army table, each with three rifle companies and a "heavy" company with machine guns and mortars. The regiment's IV Battalion had a company of 75mm light infantry guns and one of 150mm heavy infantry guns, plus a half-dozen assault guns and an anti-tank company. Four hundred men from the regiment's III Battalion conducted an air assault in Belgium, Operation Niwi, landing in 98 Storch liaison planes on an empty stretch of road between Nives and Witry on 10 May 1940. 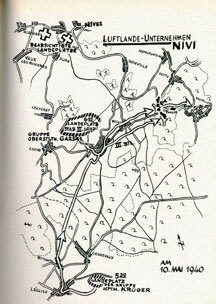 They held off attacks by the Belgian Chasseurs Ardennais and later French infantry supported by tanks. The next morning, spearheads from 2nd Panzer Division arrived to relieve them. Though daring, the operation may have actually held up the advance more than it aided the panzers, as the Belgians had been in full retreat before encountering the Grossdeutschland troops. The unexpected arrival rallied the Belgians, who stood and fought long enough for French help to arrive. The operation was a modified version of one originally intended to be launched in Poland. There would be more hard fighting ahead. Committed to the forced crossing of the river Meuse near Sedan, Grossdeutschland was the only one of the three assault regiments to break out of its bridgehead, penetrating deeply into the French fortified lines at the cost of heavy casualties. Attached to 10th Panzer Division, the regiment was in the thick of the fighting for the plateau around Stonne, just south of the river. The town changed hands 17 times over three days, as both French and German troops fought with berserk tenacity — German officers called the battle "the Verdun of 1940." 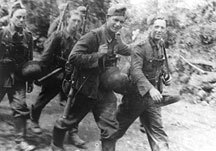 Grossdeutschland suffered 570 casualties in three days of fighting, about 12 percent of its total ration strength. Tenth Panzer was withdrawn from the front, having suffered heavy tank losses (13 tanks were shot up by a single, seemingly indestructible French B1bis tank), and the shattered Grossdeutschland Regiment went with it. Ten days later Grossdeutschland was back in action on the Dunkirk perimeter, afterward moving south against the Weygand Line. The regiment ended the campaign near Lyons, having lost over 1,200 men or almost exactly one-quarter of its strength. Afterward it went to Colmar for a month of rest and replenishment, and then to the formerly French exercise area at Belfort for further reorganization and training for assaults against England in Operation Sea Lion or Gibraltar as part of Operation Felix. The Grossdeutschland Regiment receives its own infantry and machine gun units in Panzer Grenadier: 1940 The Fall of France. They are slightly stronger than the standard units in the game, as the regiment received the very best and newest equipment available and often ended up with more than its allotment. The infantry units also have special close-range anti-tank abilities. You can download many extra Grossdeutschland pieces for 1940 right here.